Authored by Martin Luther King, Jr.
Grigar's contract of services for trAce. Details for an article entitled "The Role of Sound in Electronic Literary Works." The article was published on the trAce website in March of 2006. The editor was Randy Adams. Promotional flier for "Shapeshifting Texts: An Exhibition about Electronic and Experimental Literature". Try typing the title into a Commodore 64 or emulator. A catalog of experimental works for cicv in France. A collection of text documents detailing eLit artists, and a specific work from each. A digital translation by Dr. Dene Grigar of Plato's Apology. 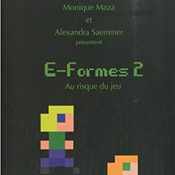 Floppy includes Greek word translations, several drafts, and word studies. The seminal work created by the ELO that argues for preservation, archiving and dissemination of electronic works. The document is a plea for writers to work proactively in archiving their own creations, and to bear these issues in mind even in the act of composition. This electronic publication contains material presented at the ACM SIGGRAPH 2005 conference, held 31 July - 04 August 2005 in Los Angeles, California. Contains two DVD-ROMs and two video DVDs with material from the Art Gallery, Computer Animation Festival, Courses, Educators Program, Emerging Technologies, Panels, Papers, Posters, Sketches, Special Sessions, and Web Graphics programs presented at the ACM SIGGRAPH 2005 conference, held in Los Angeles, California, 31 July - 4 August 2005. This CD-ROM contains all the SIGLink and SIGWeb publications on hypertext and hypermedia from all three issues of Vol. 10 of the SIGWeb newsletter. | Contains a letter from the SIGWeb Chair Elli Mylonas. This book offers a decoder for some of the new forms of poetry enabled by digital technology. A collection of five infinitely looping ambient videos that feature sights and sounds from nature and her many wonders. Digital copy of an introduction to AppleShare IP 5.0. Notable topics include the inclusion of Internet services, and integration of all workgroup services in one product. Printed version of online application for TEXTLAB event. Details commitment, responsibilities, and expectations of participants. A photocopy of Bryan's work. An exhibition catalog for a show that "captures the duality of the spectator and the performer." A collection of 16 poems, "Beyond This Silence"is yet another testament to Strickland's poetic genius. The Blue Light Project is a mobile media narrative. Composed to challenge conventional perceptions of security, the project guides participants through the campus using emergency phone towers as landmarks to discover who among their friends accused them of cocaine possession. Features comments by critics such as Katharine Hayles, Raine Koskimaa, Carolyn Guertin, and Jaishree Odin. A printed facsimile of the TEXTLAB website detailing guidelines for application. Authored by Eastgate Systems, Inc. This paper was presented as part of the MelbourneDAC 2003 Streamingworlds: 5th International Digital Arts & Culture Conference in May 2003. The flyer for Chessbard contains a description of the work as well as the series of moves involved in the chess game in which Gary Kasparov played IBM's Deep Blue as well as the poetry generated by the moves when inputted in Chessboard. The announcement card is for the book, Irresponsible Mediums: The Chess Games of Marcel Duchamp by Tucker. Code of practice document for computer users at the Nottingham Trent University. Details penalties for misuse, appeal procedures, and restriction of services. A literary journal that features along with print-based writing a section entitled IO that features works by electronic literature artists as print works. Creating Motion Graphics with After Effects 4th ed. An educational DVD detailing techniques and strategies for After Effects users. Authored by Wendy E. Owens, Ed. Contains the paper, "CypherText MOOves: A Dance with Real-Time Publication" by Holmevik and Haynes. A printed facsimile of the UAPress online catalog entry for Glazier's Digital Poetics. Contains the paper, "Dispatches from the MiddleWor(l)ds of Computers and Composition: Experimenting with Writing and Visualizing the Future" by Hawisher and Selfe. 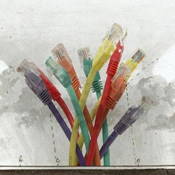 A print poetry book that delves into the issues surrounding the potentially infinite virtual spaces of the Internet. A scholarly book by Grigar's colleagues Monique Maza and Alexandra Saemmer. This set contains a catalog of early works of E-Lit and 5 floor design maps for the gallery of art works. This was part of the ELO 2008 Visionary Landscapes Conference held at WSUV. The seminal book that lays out the field of electronic literature. Abstracts, descriptions and images of the workshops, panels, papers, roundtables, performances, readings, screenings, and exhibitions from the conference. Printed email from Catherine Gillam detailing the TEXTLAB event, workshops, venue, and schedule. A user guide for the iMac. Evolution is an online artwork designed to emulate the text and music of poet Johannes Heldén, with the ultimate goal of passing "The Imitation Game Test" as proposed by Alan Turing in 1951. Eighteen faces have been cut up and bound into Facetasm - making a total of over 7,000 possible mutations to mix and match. A space on the back page for your own photo allows you to mutate yourself in the process. Floppy disk containing documents and lecture notes on MOOspace rooms and birthday logs. Word documents. Floppy disk containing a paper by Cynthia L. Selfe. A floppy containing notes and articles on MOObooks and Synchronicity logs. Focuses on collaborative work in MOOs. Provides guidelines, entry rules, process, and award information on frAme Annual for 2004.
Business card handed out to trAce members to advertise the frAme online journal. "The MOO...is a published community scrolling down the avenues of urban crossroads that morph publication into a chiasmutation of time and ap/proximation. "From Picas to Pixels: Evaluating Webtexts for Webbed Journals," a paper that explores how to evaluate hypertext writing - what makes "good" writing in hypertext? Presentation outline for "From Picas to Pixels: Evaluating Webtexts" at the Computers and Writing Conference 1998. Bob Brown's Gems (1931) has much to teach us as he spoofs the redacting censors, and demonstrates how to read like a censor. Brown published this mad-libs-like send-up in his series of visually daring books about modern reading. A collection of poems centered on the identity of a women speaker. The gallery brochure for the Glitch Mix exhibit featuring Mark Amerika. The show took place in Cuba just after the U.S. government allowed Americans to visit the country and just before the new U.S. administration worked to closed the doors again. A book about the correspondence between two characters. While reading this narrative, readers can pull out letters from envelopes and experience the forbidden sensation of reading someone else's mail. A set of images from the LinguaMOO, viewed in enCoreXpress. An itinerary for the 2014 Electronic Literature Organization Conference, featuring a full list of events and venues. A bibliography of every piece of hypermedia created before 1993. Assembled by Dr. Dene Grigar. June 11-15, 2002 | University of Marylan - College Park, Maryland. These DVDs contain the videos of presentations held at ACM Hypertext 2005, which took place in Salzburg on September 6-9, 2005. This is the poster announcing the hypertext fiction for sale by Eastgate Systems, Inc.
"Hypertextual Ways of Knowing: Mapping the Intersections of Hypertext Theory, Feminist Epistemology, and Feminist Rhetoric." In this three-pronged study, I argue for a convergence of the fields of hypertext theory, feminist epistemology, and feminist rhetoric, much like Richard Lanham, in focusing on digital technologies, argues for a convergence of social, technological, and theoretical pressures in higher education. An essay on the future of electronic writing, "In Be-Tween: Or, Writing on the Midway." Document with complete listing of delegates at Incubation2 in 2002. Document with complete listing of delegates at Incubation3 in 2004. Invitation to attend the Incubation2 conference in 2002 at The Nottingham Trent University in England. Details key speakers, themes, and purpose of event. Call for Proposal document for Incubation3 Symposium. Details guidelines and themes for the third iteration of the event. 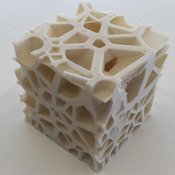 Invitation and introduction to the Incubation3 Symposium. Lists speakers, themes, history, and explanation of event. Document detailing pre-symposium information about Incubation3, including travel and venue. Print version of online document. Details the program for the Incubation3 Symposium held at The Nottingham Trent University in July 2004. The complete program guide to the Incubation3 symposium. Provides information on the speakers, venue, work abstracts, and galleries open during the event. Invitation to book launch for "trAces"
An invitation for the launch of "trAces: A Commemoration of Ten Years of Artistic Innovation at trAce" on Tuesday, 23 May 2006. A letter written to Grigar inviting her to the reception to celebrate the launch of the Writers for the Future book. Flyer for "Kids on the Net," a workshop and accompanying exhibit space for writing done for and by children. Provided teaching and learning experiences before publishing works online. A user guide for the MacBook Pro. "Mark Amerika - From Experimental Novelist to Digital Screenwriting: A Personal Narrative" A flyer advertising an artist presentation on Mark Amerika in the Bonington Lecture Theatre on November 10th, 2003. An academic transmedia project that features 20 unique augmented reality works. These pieces focus on the War of the Worlds broadcast, and give us glimpses at the fear and amazement created by the historic event. Being a 3-D paper effect journey though menopause, MenOpop offers a whimsical outlook on this stage of life. A little book that shows how much you appreciate your mother. "You feel lucky to have such a cool mom. Give her this little book and let her know she totally rules!" Various video and audio pieces about the Museum of Vancouver. A tourist guide for young people, grade 6 and up that details information pertaining to the U.S. Capitol. The official soundtrack to Myst. Composed and produced by Robyn Miller. The official soundtrack to Myst V: End Of Ages. Composed by Tim Larkin. Authored by Classical Technology Systems, Inc.
A postcard depicting various pieces of anonymous writers from an international community online. the postcard advertises trAce and provides the organization's web presence and sponsor information. Authored by Gregory Crane, Ed. This video captures the event ELO Interactions and features Megan Sapner, founder of the influential online journal, Poems That Go. She is introduced by Scott Rettberg, founder of the Electronic Literature Organization. Presentation on "Fallow Field: A Story in Two Parts"
Print document of Grigar's presentation of Fallow Field on Friday, November 14th in 2003. Presentation on "Farrow Field: A Story in Two Parts"
This is a reprint from Boston Review announcing Strickland as the winner of the poetry award sponsored by the publication. The program for the Incubation3 Symposium in July of 2004. Details speakers, events, and schedule. 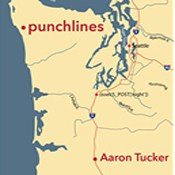 Features various hypertext works such as Shelley Jackson's Patchwork Girl, Michael Joyce's afternoon, a story, and Stuart Moulthrop's Victory Garden, as well as other Eastgate products like Storyspace and Web Squirrel. Also features a promotion for John McDaid's Uncle Buddy's Phantom Funhouse. The white ballpoint pen promoting trAce still works but is stained with ink and other residue. The blue screen cleaner is in excellent condition. A book of poetry by Ian Hatcher. A multimedia graphic memoir about the history of jazz that centers on the largely forgotten social activism forged in the 1960's and 70's by Juma Sultan. Includes over a dozen audio files from the Juma Sultan Archive. A floppy which stores various software applications and documents. A continuation of Griffin & Sabine, Sabine's Notebook is the second book in the trilogy. See Griffin & Sabine: The Extraordinary Correspondence for more information. A copy of the Spring 1996 Eastgate Systems ordering catalog. A collection of hypertext nonfiction, books, and videos from various authors are advertised throughout the catalog. Computer Graphics Annual Conference Series, 2001. Authored by Judy Malloy, Ed. A floppy which houses a collection of Dr. Dene Grigar's work, including various lectures, presentations, and syllabi. 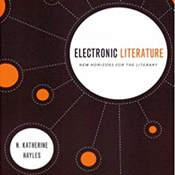 Featuring 20 authors, this book details proceedings from the Electronic Literature Organization's 2002 State of the Arts Symposium and the 2001 Electronic Literature Awards. A printed black and white facsimile of the Table of Contents for Kairos online in 1996. Evaluation form given at the end of the TEXTLAB event. Asks participants about the workshop experience, surprises, and ways to improve. Program document of entire TEXTLAB event in 2003. Details schedule, workshops, and presentations. Recommended reading for participants in the TEXTLAB online discussion forum. Details toolkits, reading lists from artists, and tutorials. This is an audio and visual account of Dr. Martin Luther King, Jr.'s speech. It was compiled and edited in the eighties, and was later migrated onto the CD. Eastgate Systems' newsletter on Hypertext and Storyspace | Summer 1995. Grigar and Mindi Corwin's essay, "The Loom and the Weaver: Using Storyspace and Perseus for Rediscover Homer's Penelope." This is Grigar's first published essay, written originally in 1993-4. 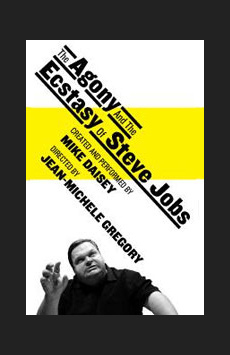 This is a script about the former CEO of Apple, Steve Jobs. Written and performed by Mike Daisy, it reflects upon Jobs' continued impact on the world we live in. Program and catalog for ELO 2015: The End(s) of Electronic Literature, which was the international conference and festival of the Electronic Literature Organization. This is a computational poem written by Nick Montfort that is printed by a dot matrix printer on continuous feed paper. "The Gathering Cloud is a hybrid print- and web-based work by J. R. Carpenter which aims to address the environmental impact of so-called 'cloud' computing through the oblique strategy of calling attention to the materiality of the clouds in the sky. Both are commonly perceived to be infinite resources, at once vast and immaterial; both, decidedly, are not." A continuation of Griffin & Sabine, The Golden Mean is the third and final book in the trilogy. See Griffin & Sabine: The Extraordinary Correspondence for more information. A journal distributed by Cyan as an add-on to the Myst experience. A poem detailing the life of Simone Weil. Winner of the Brittingham Prize in Poetry. "A pack of three tiny 8-page comics"
A strategy guide for the first Tomb Raider computer game. The guide includes a walkthrough, as well as a plethora of puzzles and secrets. A print-out of a thread discussing itinerary and recommended readings for the 2003 trAce International Conference for Writing and the Internet. 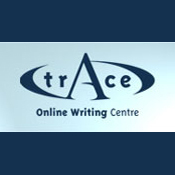 Advertisement for the trAce Online Writing School at The Nottingham Trent University. Outlines scope, course expectations, and contact information. Tributaries & Text-Fed Streams is an eddy within the internet, a place where information - commentary, image, text, metadata - coalesce for a moment, before flowing back out into and through other channels. The written word mixes and dissolves, never static, no quite discrete. The print adaption of Strickland's Hypertext narrative True North. Winner of the Poetry Society of America's Alice Fay Di Castagnola Award and the Guest Winner of the Ernest Sandeen Poetry Prize. The official soundtrack to Uru: Ages Beyond Myst. Composed by Tim Larkin. An updated print version of Strickland's V : WaveSon.nets/Losing L'una. It is an invertible book comprised of two beginnings. Stickers of the Apple logo. A draft of "What are we doing to ourselves? (Some Material Practices of Digital Publishing)" from March 23rd, 1998. Edited by Dr. John Barber and Dr. Dene Grigar. A book published by trAce Online Writing Centre that highlighted some of the authors who participated in the organization's TEXTLab fellowship. "Mapping the Relationship of Traditional Writing to New Media Writing." A detailed diagram of writing spaces in the new media network. 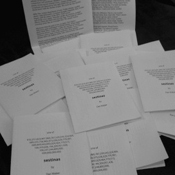 A print and digital poetry collection.